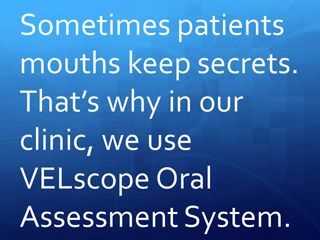 Sometimes your mouth can keep secrets when it comes to your oral health. That’s why Wright Denture Clinic (1997) Ltd provides oral cancer screenings right in our office. These screenings offer peace of mind as well as convenience because you don’t have to wait for a hospital visit. Tobacco use: In all its forms, tobacco contributes significantly to the development of oral cancer. Excessive alcohol consumption: Over 15 alcoholic beverages a week put you at a greater risk for oral cancer. Combined use of tobacco and alcohol: As expected, this increases your risk of oral cancer significantly more than either by itself. Excessive unprotected exposure to the sun: Use at least SPF 30 sunblock on your lips as unprotected exposure to the sun can increase the risk of lip cancers. Low intake of fruits and vegetable: A healthy diet is always a must. Fruits and vegetables contain protective nutrients that help keep oral cancer and other illnesses from developing. Use of betel nut and bedis: Avoid the use of betel nut and bedis as chewing or smoking them emit causative agents that create mouth cancers. Age: Older people, in general, are more likely to develop diseases including oral cancer as their immune system becomes less efficient. HPV16 viral infection: The persistent HPV16 viral infection can be a cause of oral cancer. Race, ethnicity, and economics: Certain socio-economic factors affect your chances of getting oral cancer. For example, while not related to biology, black people are diagnosed with oral cancer 2 to 1 compared to other races. Additionally, individuals who live in an area with little access to healthcare and do not routinely visit the dentist or doctor are at increased risk. Recurrence: If you have had head or neck cancer, you are at a higher risk of cancer reoccurring which may occur in the mouth or other areas of your aero-digestive tract. Gender: Men statistically are more likely to develop oral cancer than women. This is not related to biology, but lifestyle issues. It’s best to schedule a regular annual screening to look for signs and symptoms of oral cancer. Most oral cancer can be caught early, even as pre-cancer. This means survival rates are higher and side effects from treatmetns lower. Screenings are painless, quick, and inexpensive. Wright Denture Clinic (1997) Ltd uses the VELscope Vx Enhanced Oral Assessment System in our oral cancer screenings. 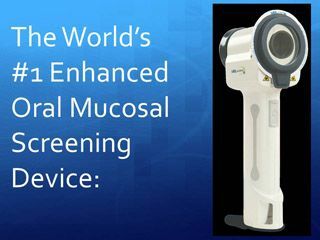 This system is considered the world’s number one enhanced oral mucosal screening device. 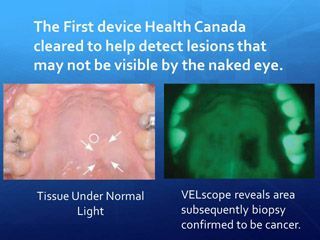 The VELscope is the first device Health Canada cleared to help detect lesions that may not be visible by the naked eye. It is recognized by the World Health Organization and has been used in over 10,000,000 examinations since its inception. The whole process takes only about two minutes with no rinses, stains, or discomforts. This short exam could save your life. Make an appointment with Wright Denture Clinic (1997) Ltd for your oral cancer screening today. We have three locations in Alberta: Edmonton, Drayton Valley, and Breton.